Just off the tip of Mexico’s Yucatan Peninsula is a small island untouched by mass tourism. Sleepy Isla Holbox might go unnoticed entirely, except for some high-profile visitors that frequent its warm ocean waters each summer. Averaging 40 feet long and weighing 15 tons, the whale sharks’ presence is hard to ignore. These gentle filter-feeders are actually not whales at all, despite their size, but the world’s largest fish. We enter the water with them in pairs, alongside our Expedition Leader, for a low-impact encounter. Docile and unafraid, they allow us to swim close enough to observe the checkerboard pattern of pale white dots and stripes covering their thick gray skin. If you’re looking for a fish tale to top all others, this is it! What Makes Our Whale Shark Adventure Better than the Rest? The few tour operators who visit whale sharks off the Yucatan do so mostly from mainland tourist resorts like Cancun and Playa del Carmen—not exactly Nat Hab's style! We, on the other hand, avoid the mega-resorts, basing ourselves on remote Holbox Island to visit a lesser-known group of whale sharks, far from tourist crowds. Plus, Holbox Island itself is a delightful, little-visited locale that adds greatly to our experience. The Best Guide-to-Guest Ratio You'll Find—Average 6 Guests Per Boat! Our small group means we have the best guide-to-guest ratio of any whale shark tour out there, with no more than seven guests enjoying the personalized service of a naturalist Expedition Leader. Depending on our group size, which will never exceed 12, we may travel with two Expedition Leaders, dividing up into two smaller groups of no more than six per boat—meaning that you'll experience an exceptional level of care, service and interpretation, plus more time in the water with the whale sharks than a typical tour gets. NHA has a global reputation for hiring the world’s best naturalist guides. Our two NHA Expedition Leaders who have long guided this trip have more than 19 years’ experience each and are among Mexico’s foremost authorities on whales and whale sharks. In addition, we are accompanied by experienced local guides, whose presence allows us to offer extra assistance in the water for those who need more support while snorkeling. Other companies' whale shark trips typically include only the local guides—not a dedicated naturalist leader throughout. See Expedition Leader bios with traveler comments regarding the quality of our expert guides. Unlike some tour operators, we are committed to a responsible, low-impact presence that prioritizes the well-being of the whale sharks. Where we travel, boats are spread out to each spend time with its “own” pod of sharks. Taking turns, we permit just two snorkelers in the water at a time, accompanied by an Expedition Leader. Though whale sharks are our main focus, we don’t miss other highlights on idyllic Holbox Island and the Yucatan coast. From exploring the mangroves of Isla de Los Pajaros, teeming with shorebirds and seabirds, to swimming in a freshwater cenote and snorkeling over the barrier reef, you'll experience a thrilling array of tropical nature adventures during our compact Mexico journey. Our boat drivers and local guides are certified by the Mexican national park system, each year undergoing a refresher course about whale sharks as well as marine regulations—this is not the case with many of the local operators that other U.S.-based tour companies use in this area. 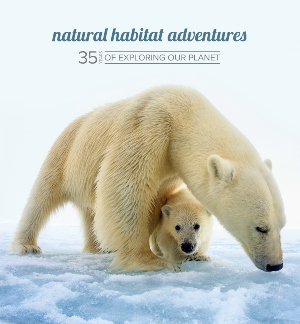 With Natural Habitat Adventures, you receive our exclusive quality and value guarantee that we will meet the lofty expectations we establish in our promotional materials. To our knowledge, this is the most ambitious guarantee made by any adventure travel company. Read our important promise. Because of our commitment to environmentally conscious travel, as well as the outstanding quality of our worldwide adventures, World Wildlife Fund, the world's leading environmental conservation organization, has named Natural Habitat as its worldwide travel partner, a designation that makes us exceedingly proud!